Nozawa Onsen is the name of a small village and snow resort located to the north east of Nagano City in the north east region of Nagano Prefecture, close to the border with Niigata Prefecture. Famous for onsen hot springs throughout the year as well as large amounts of quality snowfall during winter, Nozawa Onsen is one of the more well-known ski and snowboard resorts in Japan. The village was host to the biathlon events during the Nagano Winter Olympics in 1998. 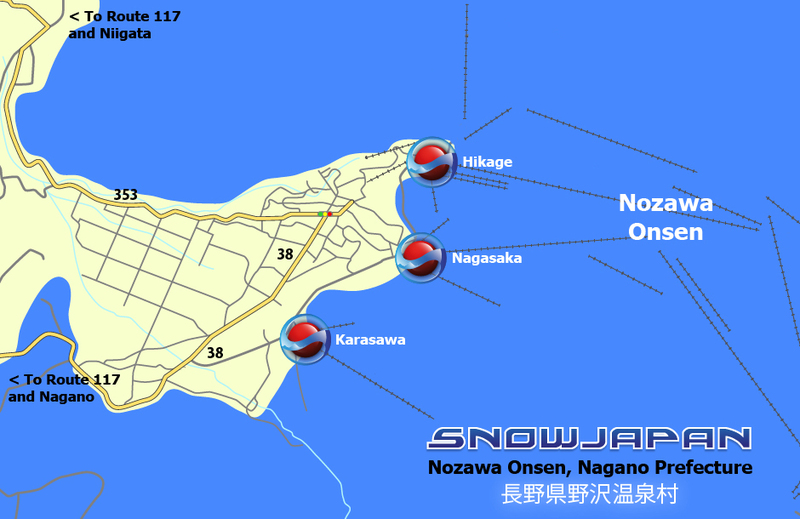 Nozawa Onsen is located a few kilometres off the Route 117 road which connects Nagano City in Nagano Prefecture with Ojiya City in Niigata Prefecture. 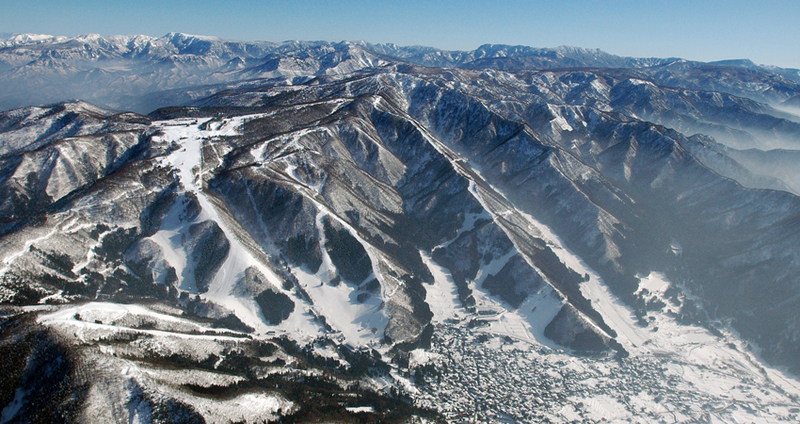 The smaller and less well-known Togari Onsen resort can be found on the opposite side of the road (about 10km drive), with another ski hill called Sakae Club about 21km to the north east towards Niigata. The nearest exit of an expressway to Nozawa Onsen is the Toyota Iiyama IC on the Joshinetsu Expressway. Those travelling from Nagano City, the west and south west regions will probably use this route to approach Nozawa Onsen. From the Toyota Iiyama IC exit, turn right onto Route 117, go through the main shopping road area of Iiyama City and follow the signs to Nozawa Onsen. The journey from the Toyota Iiyama IC to Nozawa Onsen is about 20km. From Tokyo, many people choose to use the Kanetsu Expressway to head north and continue through the Tanigawadake mountain range in Gunma Prefecture into Niigata Prefecture, exiting the Kanetsu Expressway at Shiozawa Ishiuchi IC. After exiting the toll booth at Shiozawa Ishiuchi IC, turn right and continue for 1km until reaching Route 17. Turn left onto Route 17 towards Yuzawa and after about 650m turn right onto Route 353. Continue on Route 353 for about 18km until reaching the Route 117 junction. Turn left onto Route 117 (Nozawa Onsen is on the main signpost). 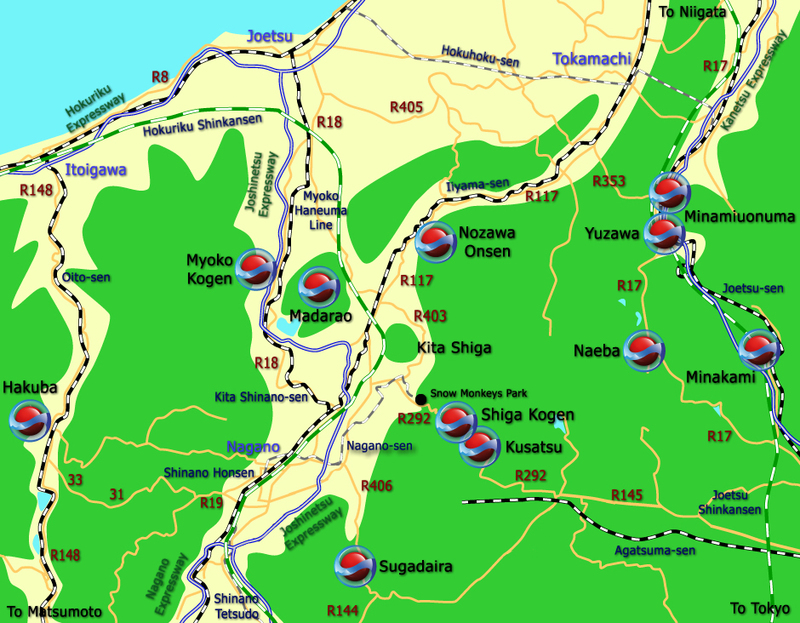 The turn off for Nozawa Onsen is about a further 31km. The village can be found nestled at the bottom of the mountain about 4 km off Route 117. The journey from Shiozawa Ishiuchi IC to Nozawa Onsen is around 55km and in good conditions can be made in around one hour. If you want to save a little on the expressway tolls, you can exit the Kanetsu Expressway at Yuzawa IC (the exit before Shiozawa Ishiuchi IC). Turn right at the exit and travel about 11km to the left turn that gets you onto Route 353. In clear conditions that will only add about 5 minutes to the journey. From western Japan regions approaching on the Chuo Expressway, change over to the Nagano Expressway at Okaya JCT and head towards Nagano City. Continue on the Nagano Expressway until the Koshoku JCT where the road changes into the Joshinetsu Expressway. Exit the Joshinetsu Expressway at the Toyota Iiyama IC exit. From central Nozawa, take Prefecture Road 38 south towards Nagano City and after a few kilometres turn right onto Prefecture Road 410 at the sign for Nagano and Route 117. On arriving at the Route 117 junction about 1km later, turn left and head towards Nagano City for about 8km. There are a few different ways to get up to Madarao from Route 117 but following the signs from Route 117, turn right and then right again after about 450m. Cross over the train line and then turn left onto Prefecture Road 97. Follow this road and the signposts up to the Madarao area. From central Nozawa, take Prefecture Road 38 south towards Nagano City and after a few kilometres turn right onto Prefecture Road 410 at the sign for Nagano and Route 117. On arriving at the Route 117 junction about 1km later, turn left and head towards Nagano City, through the main shopping area of Iiyama City until you reach the Toyota Iiyama IC of the Joshinetsu Expressway in about 15km. Take the expressway north for about 20km and exit at Myoko Kogen IC. (Alternatively, take the more scenic mountain route and go past Madarao Kogen and Tangram Ski Circus on Prefecture Road 97). From central Nozawa, take Prefecture Road 38 south towards Nagano City and after a few kilometres turn right onto Prefecture Road 410 at the sign for Nagano and Route 117. On arriving at the Route 117 junction about 1km later, turn left and head towards Nagano City. Go through the main shopping area of Iiyama City until reaching the sign to turn left for Nagano and Nakano about 11km later. Turn left here and follow Route 292 and the signposts up to the Shiga Kogen area. From central Nozawa, take Prefecture Road 38 south towards Nagano City and after a few kilometres turn right onto Prefecture Road 410 at the sign for Nagano and Route 117. On arriving at the Route 117 junction about 1km later, turn left and head towards Nagano City, through the main shopping area of Iiyama City until reaching the sign to turn left for Nagano and Nakano. Follow the signs and Route 18 into Nagano City. Alternatively, take the Joshinetsu expressway south from Toyota Iiyama IC to either the Suzaka Nagano Higashi IC or Nagano IC. From central Nozawa village head towards Route 117 on Prefecture Road 353. Turn right onto Route 117 heading towards Tokamachi and Sakae Village. After passing through Tsunan Town, and about 31.5km after joining Route 117, turn right on Route 353 which is signposted as Shiozawa and Route 17. Continue on Route 353 for about 18km until reaching Route 17. From this junction turn right to head into Yuzawa town. (Turn left for some resorts in Minamiuonuma). From central Nozawa, take Prefecture Road 38 south towards Nagano City and after a few kilometres turn right onto Prefecture Road 410 at the sign for Nagano and Route 117. On arriving at the Route 117 junction about 1km later, turn left and head towards Nagano City, through the main shopping area of Iiyama City until you reach the Toyota Iiyama IC of the Joshinetsu Expressway in about 15km. Take the expressway south for about 20km to the Suzaka Nagano Higashi IC. At the Suzaka Nagano Higashi IC exit, turn right onto Route 403 for less than 1km and then turn right onto Prefecture Road 58 where Sugadaira is signposted. Follow that road for about 6km until arriving at some traffic lights on Route 406. Turn right onto Route 406 and head up to Sugadaira! From central Nozawa, take Prefecture Road 38 south towards Nagano City and after a few kilometres turn right onto Prefecture Road 410 at the sign for Nagano and Route 117. On arriving at the Route 117 junction about 1km later, turn left and head towards Nagano City, through the main shopping area of Iiyama City until you reach the Toyota Iiyama IC of the Joshinetsu Expressway in about 15km. Take the expressway south for about 30km to the Nagano IC. At the Nagano IC exit, turn right onto Prefecture Road 35 for just under 3.5km heading towards central Nagano City. At the Route 19 (Nagano Minami Bypass) junction, turn left - Hakuba is signposted. After about 13.5km on Route 19 turn right onto the Hakuba Nagano Toll Road (210 yen) and from there Prefecture Roads 31 and 33 will take you straight into Hakuba. For detailed information on how to get to Nozawa Onsen by train and public transport, please go to this section.